Allegra Boverman/Gloucester Daily Times. 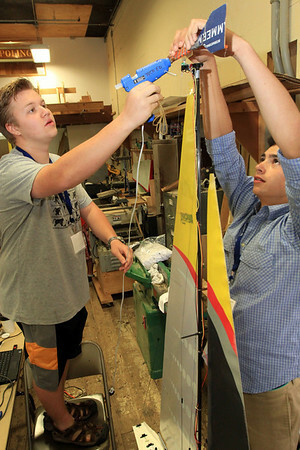 During the Sailbot 2013 events on Monday afternoon at Maritime Gloucester, the team Spark, Spark, Boom, Boom from Newburyport High School was working on their boat, here, attaching a windvane. At left is Theo Dubus, a sophomore, and at right is Alec Redukcer, a freshman. The competitions among robotic sailboats continue through Wednesday in Gloucester, with races being held at Pavilion Beach. See http://sailbot.org/ for more information. Teams from Canada, Wales and around the U.S. are in Gloucester for the event.